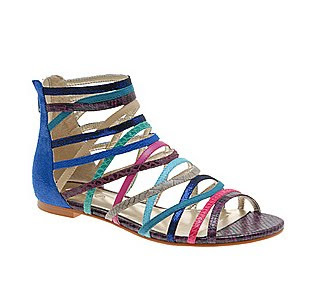 According to Aldo (LOVE LOVE) Gladiator shoes such these are the must have of the season. I'm sorry, but I just can't get into this trend. It looks like my grandma's shoes on crack. Bring on the hot pink Mary Kay lipstick and you've got yourself quite the look. Anyway, I'm not exactly the most fashion forward person, but I would love to find someone who can actually pull this look off. Anyone with me on this?? these must go AWAY.. much like croc's & socks.. yuck! It's a crime to wear these unless you can rock them with ratted hair, hot pink lips & truck stop blue eyeshadow. These would look as flattering at the base of my 29" inseam as jelly shoes did when I was growing up.